German Shepherds are an incredibly popular breed of dog in America, and for good reason. They are intelligent, loyal, family friendly, and trainable. When you’re looking for a German Shepherd puppy, it’s important to consider who you’re buying from and what the parents of the litter you’re picking from are like. 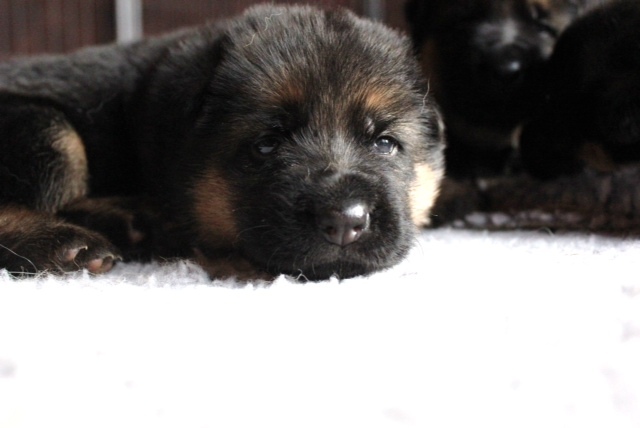 As far as German Shepherd puppies for sale in Chicago, IL go, you’ll find no better place to find your new family member than Roche’s Pedigree German Shepherds. Here at Roche’s, we know that buying a puppy isn’t a decision you make on a whim and we understand that you’re making an investment of emotion, finances, and time when you purchase a German Shepherd puppy. Our dogs are best in class and have impeccable bloodlines. They are kind, well-behaved, excellently formed, and all around gorgeous animals and each litter that comes through Roche’s German Shepherds meets or exceeds that expectation. We take the care and of our dogs very seriously and believe this translates into healthier, more well developed German Shepherd puppies for you to choose from. When you reserve a puppy, you’re placing confidence in us and our animals to produce a loyal, trustworthy member of your family and we take great honor and pride in that. As you search for the perfect place to buy German Shepherd puppies, call us at Roche’s Pedigree German Shepherds and we guarantee your satisfaction with the experience and the puppy you’ll get to bring home. We are happy to troubleshoot questions prior to the reservation of your new German Shepherd puppy and invite you to come meet the parents. Our breeding females and standing stud dogs will certainly convince you of the quality of puppy you can expect from us here. For German Shepherd puppies in the Chicago, IL area, look no further than Roche’s Pedigree German Shepherds. Reserve your puppy today!